“When a man has an idea, and it is a worthy idea, the world usually stands to profit a little. John Baylay was born in 1909. In his early years he developed asthma and his father decided to move the family to Washington State, USA, when John was three. They had a small farm near Snohomish, close to John’s uncle, where they kept various animals. In 1914, the Great War began and John’s father decided to return to England to enlist in the Army. After completing basic training, he went to the Front, and in 1915 was reported “missing in action”. John was only six years old, and was then brought up solely by his mother. They moved to Bosham in Sussex, and John started to learn to sail in Chichester harbour in a 14 foot lugsail boat at the age of 10. John left the bank after realising he was not cut out to be a banker, and had a variety of engineering jobs. He was studying for his AMI(Mech)E exam when the Second World War started. As he was already a junior officer in the Territorial Army, he was soon in action with the British Expeditionary Force in Belgium, and involved in their retreat to Dunkirk. His next posting was with the newly-formed 2nd Tactical Air Force, operating from mobile airfields, as an Air Liaison Officer. He was sent to Africa with the Royal West Africa Frontier Force, and was involved in supply drops into Nigeria and Ghana. He flew in a Dakota when his unit was sent to India, via Khartoum and Aden. In India they practiced supply drops, which would be used to aid the troops fighting in Burma. In his spare time he worked on small boat designs. During his time in India, John commanded African and Indian troops, and acted in a liaison role with the Americans. He was promoted to the rank of Major after 6 months and his new unit was sent into Burma. At the time of VJ Day he came into contact with men who had been imprisoned by the Japanese and had been forced to work on the Burma Railway. The unacceptable face of war left an indelible memory. His illness with dysentery had him invalided home on the Durban Castle, and he was demobilised after six months in England. By now he was in his mid-thirties, and with his wife, Beth, he tried his hand at managing a hotel in Brighton. 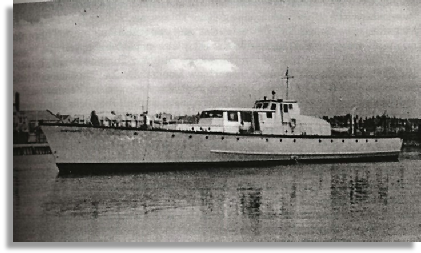 At this time there were many war-surplus boats on the market, and John bought a 109ft former Navy MTB (ML120, renamed “Onetwenty”). The boat was towed to Shoreham and occupied a mud berth. John set about redesigning her with relish, and worked with local craftsmen on her conversion into a motor cruiser. This was quite a vessel for someone with no experience of the operation or navigation of such a craft, but John and Beth ran charter cruises as far afield as Holland, Belgium and Lisbon in Portugal in their “Gin Palace”. These activities cemented in John’s mind a love of boats and life on salt water. Unfortunately, there was a recurrence of John’s wartime illness and he was forced to go into hospital and undertake extended convalescence. 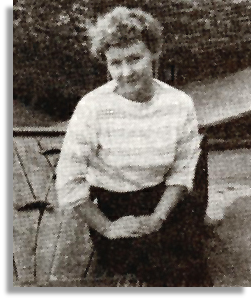 Beth too had a legacy of illness and back problems from the War and was obliged to recover aboard “Onetwenty” moored at Itchenor, close by where John had first learned to sail. John was offered the job of manager and instructor at a sailing school in Salcombe, Devon and moved there while Beth recovered in Itchenor for almost a year. He spent two seasons instructing pupils in dinghy sailing, and also sailing larger craft along the coast of Devon and across the Channel to France. The sailing school used a large yacht as a base for sailing the dinghies. A Thames barge was acquired by the owner and John was involved in the conversion into a sailing school headquarters and accommodation facility. The sailing school flourished and revenue trebled, as many people wanted to enjoy the pleasures of sailing for the first time. John had a problem with the notion of customers who had no responsibility for the care and upkeep of their craft. He conceived the idea of a Club which would regulate members and give them a sense of pride and ownership. He floated his idea with some close colleagues and customers at the sailing centre and had a very positive response. However, he did anticipate a large amount of resistance from the yachting establishment, who were used to clubs where the wealthy members owned and sailed their own boats. 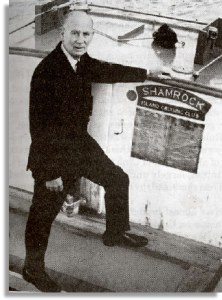 The Island Cruising Club was launched in October 1951, using loans from John Baylay and some of his friends and relations as capital. The first boat, Provident, was loaned to the ICC by its owner, whose wife had been seasick on their maiden voyage. John encouraged his old friends to work in the club and soon a second boat, Hoshi, was added to the fleet. With John as Commodore, the ICC grew rapidly, and in its heyday had several thousand members and a fleet of dinghies, keelboats and yachts, together with a series of ever-larger ships used as headquarters, and properties ashore. John worked hard in the Club as an instructor, skipper, and guiding light. His wife Beth was Treasurer for 21 years. The club concept proved very popular, and he was able to pay back the initial loans and invest in more boats and equipment. John’s ideas for teaching sailing were to form the basis of nationally recognised courses and qualifications administered by the RYA in later years. The Club was highly respected and well known, and members were allowed to sail on the Royal yacht, Bloodhound. Sub-sections were formed in different parts of the country, and the 21st annual dinner was held in the Café Royal, London. At the same time, John was building a large commercial enterprise in the form of the sailing clothing firm, Offshore, which retailed through the Sea Chest stores in southern England. This enterprise helped to fund the ICC in the early days and was sold off in 1970 to the other directors. Meanwhile, it had become the defacto sailing clothing brand in the UK. In 1974, at the age of 67 John Baylay and Beth decided to start a new life in New Zealand after enjoying a holiday there, visiting his daughter Anne and his grandchildren. Spurning retirement, he and Beth bought a motel and a guesthouse in North Island, at Warkworth. They set about refurbishing both properties and making improvements and they ran them for four years, Beth working in the restaurant as chef.